After having satisfied my taste buds with a variety of spicy and not-so-spicy foods, I can say that Garhwali food is undeniably tasty. The delicacies do not require elaborate cooking procedures and have the right mix of farm-fresh ingredients and relatively less known spices. Mostly, the delicacies are not available in urban eating joints, even in Garhwal. If one wants to taste authentic recipes, one has to plan a trip to Uttarakhand and look for home-stay options rather than commercial establishments. Spices such as jakhiya (Cleome viscose), faran (Allium stracheyi), choru (Angelica glauca), dolu (Rheum austral) and chippi (Pleurospermum angelicoides) are sometimes used in Garwhali dishes and can leave an exotic feel on the taste buds. Jakhiya is primarily used for tempering while faran, choru, dolu and chippi are used in preparing spices and other add-ons. The spices grow in the wild or in fallow land of the region. The Indo-Mongoloid Bhotia tribe of Garhwal have traditionally been collecting their spices from higher Alpine riches and dry temperate forests in areas with 500 m to 1,500 m altitude. They also grow the condiments in their cropland and kitchen gardens and sell them to people living in low altitudes, sometimes even use them for bartering. My first exposure to jakhiya was in 2004 during my stay in Niti valley’s Tolma and Shersi villages in the upper Kedarnath valley. Jakhiya is also known as wild mustard or dog mustard. The seedsare small, dark brown or black. My breakfast everyday, and often dinner too, used to be harasaag with chapati. 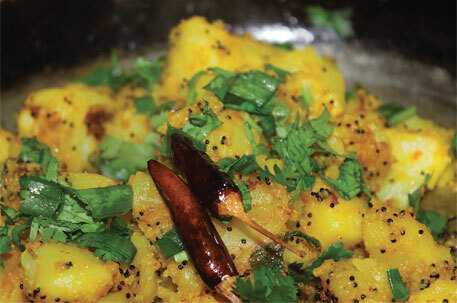 Hara saag is made of potato, spinach, pumpkin and mustard leaves, with a special tempering of jakhiya seeds. “Don’t be surprised. This is not mustard, but jakhiya—our own mountain Garhwali jeera,” my host Rudra Singh Butola, a native of Tolma village, would say. Because of its sharp pungent smell and crunchy taste, most Garhwalis prefer jakhiya over cumin and mustard seed for tempering. It is used in tempering of harasaags, vegetables, curries, pulses—almost everything that needs to be tempered before or after cooking. Jakhiya is one of those pungent herbs that give Garhwali food the taste of mountains. “You cannot experience authentic Garhwali taste without it,” says Rashmi Todariya, my maternal aunt who is a native of Kandadhar village situated in the higher reaches of Deoprayag. Leaves of jakhiya are also eaten as substitute for green vegetables in villages. Jakhiya is found in tropics throughout the world and is used in traditional medicine in many parts of India and outside. Almost all the parts of the plant are used for treating diseases. According to the Treatise on Indian Medicinal Plants, published by the Council for Scientific and Industrial Research in 1991, the plant is used for treating fever, inflammations, liver ailments, bronchitis and diarrhoea. 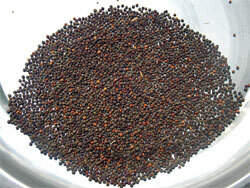 The oil extracted from jakhiya seeds has medicinal properties. Fresh oil of crushed seeds is used for treating infantile convulsions and mental disorders. Several published studies have shown that leaves of Cleome viscosa are useful in healing wounds and ulcers. A 1999 study, published in the journal Economic Botany, also talks about the agro-ecological significance of jakhiya. The study, undertaken by R K Maikhuri of Almora-based G B Pant Institute of Himalayan Environment and Development, says jakhiya is not a commercial crop because most of it is consumed locally. People collect the seeds and gift them to their kin living in areas where jakhiya does not grow. As the unique tang and essence of jakhiya has gained popularity, the demand for its seeds has increased in the region. Farmers have started paying more attention to the crop. The seeds, which are dried in the sun before they are sold, fetch over Rs 200 per kg and the price is increasing every year. Growing jakhiya does not involve too many financial inputs. The rainfed crop can even grow in extremely poor soils as a weed. According to an article published in the International Journal of Researchin Pharmacy and Chemistry, the high protein and amino acids, minerals content of this plant can make it a crop of high economic importance. Another recent publication in the Indian Journal of Experimental Biology says Cleome viscos can be considered an efficient source of biodiesel. Oil of the plant has all the properties which jatropha and pongamia have. Boil the potatoes, peel and chop. Heat oil in a thick-bottomed wok, add asafoetida and jakhiya. When they start to crackle, add chopped potatoes, turmeric powder, chilli powder and salt. Mix well and keep on fire for 5-10 minutes for crispy taste. Garnish with freshly chopped coriander leaves, garlic leaves and fried dry red chillies. Serve with tea.